(AFP) - British Prime Minister Theresa May will on Thursday begin trying to sell her Brexit deal to parliament, boosted by news that Europe is preparing a rapid summit to sign off on the agreement. May won her cabinet's approval for the agreement during a five-hour meeting on Wednesday, an important step that helped allay growing fears in the business community of a disorderly divorce. May's Conservative Party was already split between Brexiteers and those who wanted to remain in the union, and now many on both sides of that divide oppose her deal. She suffered a blow on Thursday morning as junior Northern Ireland minister Shailesh Vara resigned saying the withdrawal agreement fails to leave the UK as a "sovereign, independent country". The volatility of the pound on Wednesday -- plunging on unfounded reports of resignations before rebounding -- highlighted how much uncertainty there remains around Brexit. Hardline Brexit supporters in the ruling Conservative party have cried betrayal over the agreement's vision of a close future relationship between Britain and the EU. Veteran MP Peter Bone warned May on Wednesday that she risked losing the support of "many Conservative MPs and millions of voters". Jacob Rees-Mogg, leader of an influential group of anti-EU MPs, urged colleagues to reject the deal. Former UK Independence Party (UKIP) leader Nigel Farage, a key figure in the 2016 Brexit vote, said it was "the worst deal in history". May insisted it "brings back control of our money, laws and borders, ends free movement (of people), protects jobs, security and our union". But she conceded there were "difficult days ahead" as she seeks to woo MPs. Speaking in Brussels, Tusk said EU member states would have until Tuesday next week to examine the deal and to agree the wording of a parallel political statement setting out goals for the bloc's future relations with London. "Finally, let me say this to our British friends," he said. "As much as I am sad to see you leave, I will do everything to make this farewell the least painful possible, both for you and for us." The same arrangement would see even closer alignment for the British province of Northern Ireland, something May's allies, the Democratic Unionist Party (DUP), are resisting. With the DUP's support, the Conservatives have a slender majority in the 650-seat House of Commons, but the scale of the rebellions have left May courting opposition MPs. The prime minister also met on Wednesday with Labour leader Jeremy Corbyn, who has indicated he will reject the Brexit deal. 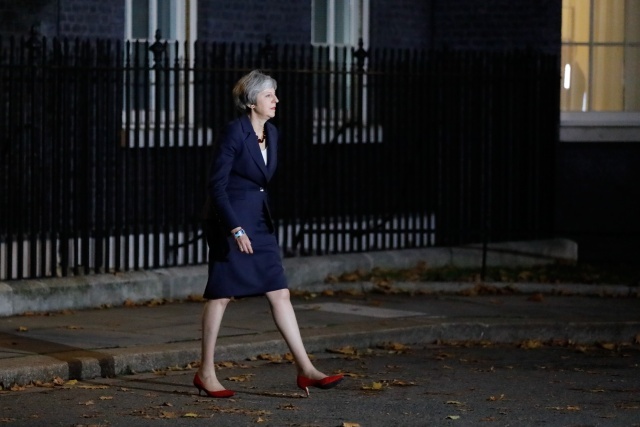 In a statement outside Downing Street late Wednesday, May said her deal was "the best that could be negotiated". She also raised the risk of "no Brexit at all", a warning likely intended for her eurosceptic MPs but which was seized upon with enthusiasm by campaigners for a second referendum.